Make sure to check which venue your class is at. For more information and class times, check the timetable here. This car park entrance is hidden, and can only be approached from the directions drawn on the map below. There is a double line which prevents turning into the back car park driveway from the other direction. Entrance via back driveway on College Rd. (stick in the left lane). Once parked, cross the bridge and go to the bottom level of the Indoor Sports Centre. The car park will be open 30 minutes prior to the session starting, and 30 minutes after the session has finished. Please note that Brisbane Boys Grammar School is private property, and as such, any car left on the property outside of these hours will be towed at the owner's expense. Entrance via Old Cleveland Rd or Tilley Rd. Once on Ring Rd, park in car park two and walk to the Gymnastics Hall. Car park entrance via Old Cleveland Rd or Tilley Rd. Please note that the Sleeman Sports Complex is private property, and as such, any car left on the property outside of these hours will be towed at the owner's expense. We currently do not offer classes at Somerville House. We will post an update when this changes. Street and venue parking available. Car park entrance via corner Stephens Rd, Brook St. Please note that Somerville House is private property, and as such, any car left on the property outside of these hours will be towed at the owner's expense. 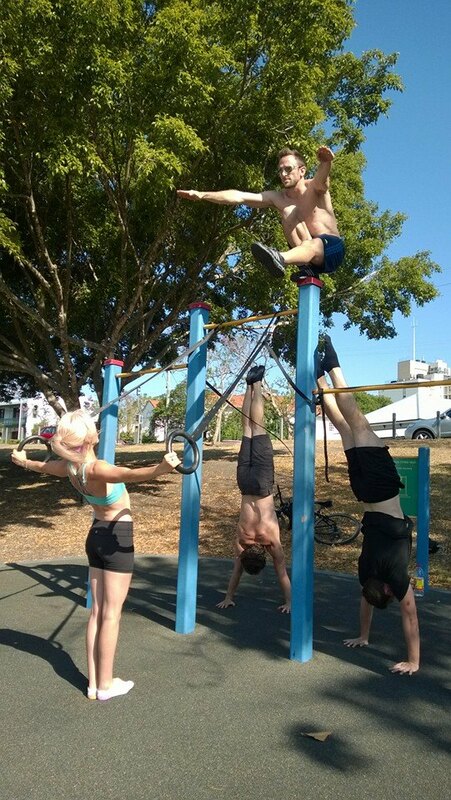 We occasionally have park workout sessions at Victoria Park, Spring Hill and the Brisbane Powerhouse, New Farm. As the sessions are sporadic and varied, we announce session times on our Facebook page. These usually occur during weekends and school holidays, while our main venues are closed. Meet at the chin-up bars. Meet at the front of the Powerhouse (Performance Lawn).